Is The Live Sports Rights Bubble Finally Bursting? Over the past decade, television broadcasters have bet that DVR-proof live sports will remain highly profitable, and shelled out tens of billions of dollars to acquire broadcast rights to the NFL, NBA, MLB, Olympics, World Cup, college football and basketball, and all other sports imaginable. 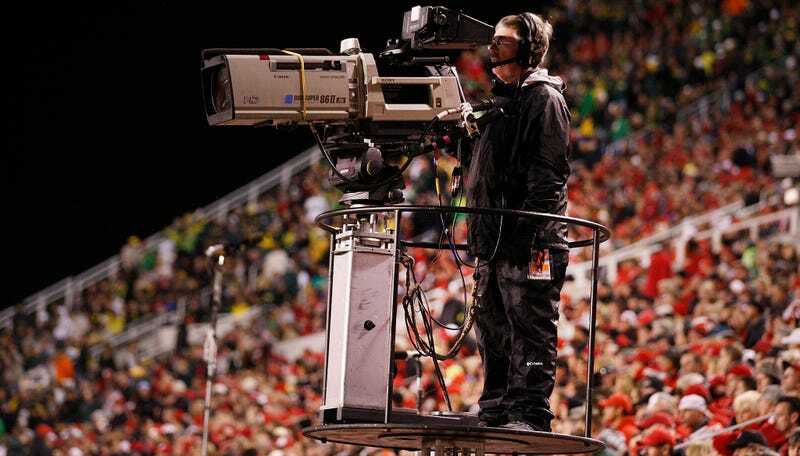 Fox, CBS, and NBC all created sports-only cable channels, and the Longhorn Network, SEC Network, Big 10 Network, and Pac-12 Network were all launched. To a large degree, paying rights fees is an exercise in extreme speculation. In a recent example, CBS and Turner decided to pay $8.8 billion for March Madness rights that extend through 2032. By that time, the combined effects of cord cutting, a la carte, over-the-top, mobile, and other concepts we can barely conceive of (virtual reality?) will mean that the way television is broadcast, consumed, and paid for will be radically different. Agreeing to pay $1.1 billion annually—a 40 percent increase on what the rights used to cost—18 years out is a tremendously speculative bet on the idea that live sports will continue to generate vast amounts of money. There are a lot of other sports networks in trouble, too. CSN Houston was a failure that went bankrupt, the Dodgers’ massive deal with Time Warner Cable SportsNet LA is a disaster, the Pac-12 Network is struggling, the Longhorn Network is a failure, and CBS doesn’t even bother to have CBS Sports Network’s tiny viewership rated by Nielsen. In part because of all this, the price for some live sports rights is, right now, declining, auguring a scary future for sports leagues—who rely on these fees increasing—when the big contracts come up again in the 2020s. According to John Ourand at the Sports Business Journal, the French Open, Conference USA, and International Champions Cup recently struggled to find payers for their broadcasting rights, and in some cases accepted less money than they had gotten in previous contracts. In its initial Fox meetings, the ICC sought to more than triple its rights fee, sources said. Fox declined, leading the property to go to other networks to try to drum up interest. Other sports networks expressed interest, but not at the prices the event was seeking. ESPN said no. NBC Sports passed on it, too. Eventually, the ICC went back to Fox and said it would re-up at the same rate — with no rights fee increase. Stunningly, Fox again said no and countered with an offer well below market value. The property ended up signing a three-year deal with ESPN at terms well below its initial ask, according to several sources who added that ESPN is paying less than $500,000 in the deal’s first year for the series, a figure that includes a lot of marketing and promotion. The price increases in the next two years. It’s worth noting that the ICC, Conference USA, and a third-tier French Open package are hardly the rights broadcasters go gaga over, not necessarily because they don’t draw many viewers—though they don’t—but because they don’t give sports channels any leverage with cable distributors or advertisers, which is where broadcasters make their money. They aren’t necessarily canaries in the coal mine, but they were previously drawing outsized rights fees beyond what they logically ought to command. It’s instructive that Ourand reports that rightsholders are looking to digital media companies like Yahoo, Google, Facebook, and Twitter to save them. Considering everything we know about advertisers’ TV dollars turning into digital pennies, and the public’s extreme reluctance to pay for digital content, expecting billions from internet companies to prevent the sports rights bubble from bursting seems rather desperate indeed. Twitter is currently paying 1/45th of what CBS and NBC are paying to broadcast NFL games. Nobody knows yet how to monetize the internet, and rightsholders’ future profits in large part depend upon them being the ones to finally figure it out. If I were a shareholder in any of these sports channels, that prospect would fill me with worry and dread.